Welcome to the West Houston subdivision of Briargrove Park, conveniently located just inside Beltway 8 and Briar Forest Drive. 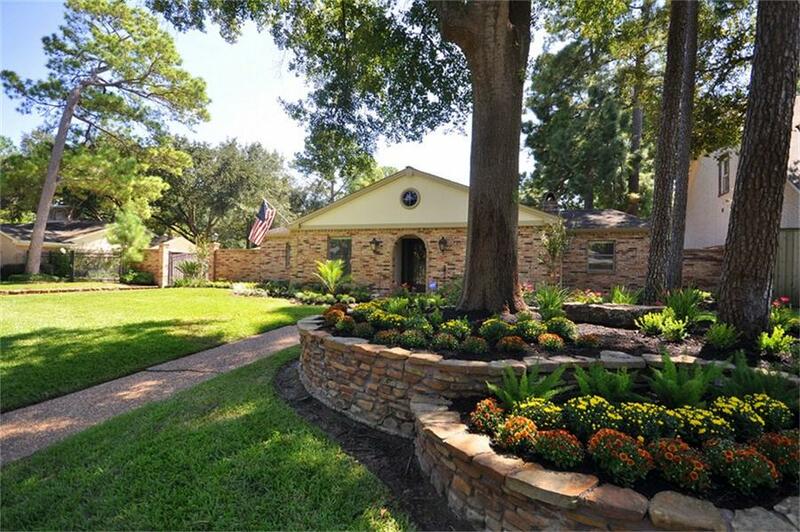 10211 Shady River Drive is a stunning 4 bedroom, 3 bath home. Originally the builder's home, it was stripped to the studs in 1998 and completely rebuilt with major additions. As you can see in this virtual tour and the photos below, there are numerous features that could make this the perfect home for you. You can see more images of 10211 Shady River here or in the video below. ♦ Entry path with raised landscaping beds featuring stone borders. The long driveway with raised stone pavers leads to parkiing inside the 4-car garage. ♦ Large island kitchen with slate floors, recessed and under-cabinet lighting, double bullnose granite counters, stainless appliances, gas cooktop, stone backsplash, custom cabinetry, and tons of storage. ♦ Master bedroom features coffered ceilings, recessed and reading lights, and pocket doors leading to the study / exercise room / nursery. ♦ Both master closets are loaded with built-in shelves and cabinets. One closet opens to a hidden room and leads to the attached 4-car garage. The hidden room could be used as a craft room, hobby room, or whateveer fits your life. It's filled with walls of cabinets. shelves, and undercounter lights. ♦ Master bath has granite counters, traventine floors, custom cabinets, steam shower, jet tub, and two master closets. From one of the closets, you can enter the hidden room with cabinets, lighted counters, and a tile floor. Perfect as a craft room. ♦ 4 car garage is insulated and has its own A/C, plumbing hook-ups, built in compressor, walls of cabinets and work counters, and a commercial grade door. Adjoins gated driveway, 2 car porte-cochere, and patio. ♦ Inviting yard, large enough for a pool, with new landscaping for family and pet activities. Sprinkler system and french drains.